There is no harm in enjoying a drink or two or drinking socially, but an excess of alcohol consumption is always harmful to the body. One of the long lists of health problems that are caused by alcohol is alcoholic hepatitis. In simple terms, it is the inflammation of the liver. The liver is the main organ which is badly damaged in this disease. The main function of the liver is to detoxify the body. Heavy drinking episodes can cause the liver to become severely inflamed, fatty and scarred. Many studies have explained how alcohol damages the liver. Once the process of breaking down of alcohol starts, it produces very toxic substances. These toxins, in turn, can cause high levels of inflammation that destroy liver cells. As it keeps happening over a period of time, the poor liver becomes highly damaged and scarred. Ultimately, liver cirrhosis is the final stage of this health condition. Jaundice is the most common sign and symptom of alcoholic hepatitis. This condition is characterised by yellowing of skins and eyes. Some of the common complications that can occur as a result of alcoholic hepatitis are enlarged veins in the stomach, ascites (infection of an excess of fluid that is accumulated in the abdomen) and high blood pressure in the liver due to reduced blood flow in the scarred liver tissues. Liver damage can also affect the proper blood flow to the kidneys hampering its functioning too. Ry If the liver is unable to remove the build-up of toxins in the blood, it can cause damage to the brain too and causes a condition called hepatic encephalopathy. The main symptoms of cephalic encephalopathy are slurred speech, drowsiness and confusion. The correct diagnosis of alcoholic hepatitis is done by studying the medical history of the patient, blood tests to check the high levels of liver enzymes as well as a liver biopsy. The individual affected with alcoholic hepatitis is also more prone to bacterial infections and has to be treated with antibiotics. Certain steroids can also be administered to reduce the swelling in the liver. 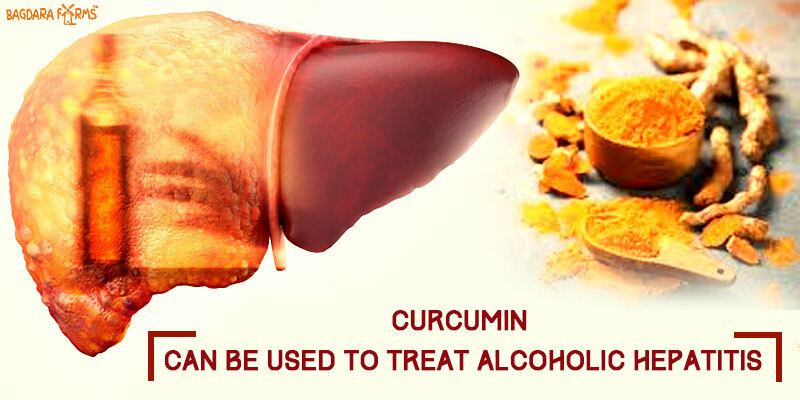 Curcumin can be used to treat alcoholic hepatitis without the side effects of allopathic medicines since it is a great anti-inflammatory agent. The antioxidant property of curcumin can also help to prevent the further scarring of liver tissues. Bagdara Farms has the best quality curcumin as it is grown minus any kind of chemicals. 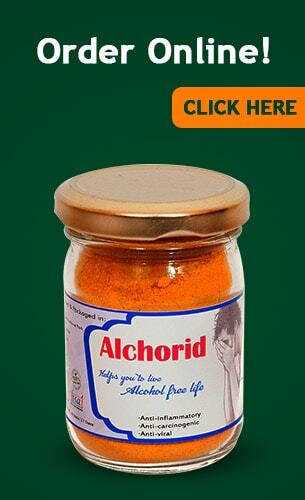 Alchorid can help you beat alcoholism and leave alcohol with regular use. Yes, sir, Alchorid is the best solution for this as it has a higher percentage of Curcumin and also the product is 100% organic and GMO free. I was diagnosed with liver cirrhosis stage 1 due to my habit of excessive alcohol intake. I could gulp down one whole bottle of alcohol in one night. I guess my body could not take it after a year or so. After a few months, hepatitis set in and I could barely move out of my bed. Treatment was started immediately and I also took Alchorid side by side. Liver has improved a bit and still taking it to start living my healthy life again. sir can i use if i want to stop my cigrette too. Sir, our product Fukamin-A helps in curbing the urge to smoke and reduces the nicotine induced toxicity due to the innate properties of curcumin in this product. It can be taken with Alchorid simultaneously. You will have to take 1 dose of each product once a day. Detailed information about Fukamin-A is available on the following link https://bagdarafarms.com/product/fukamin-a/ Hope this information helps. I’m a pancreatic patient. Can I take this without risk? Yes it can be used by you sir. It has no side-effects and will cause no harm to you. My father had a liver transplant( Ethanol related).We can give him or not..? We can recommend for your father our product Livturm sir. Detailed information is available on the following link https://bagdarafarms.com/product/livturm/ You can also use the same link to order the product. The product is 100% organic and has no side-effects. We offer a 20% off for online payments. Sir, we are very sorry for the trouble caused. Please share with us your order number and we will get the correct product dispatched and will get the wrong product picked up. Thank you. Please call me once on tomorrow for details required of item . Sure sir. We are more than happy to do that, but you will have to provide us with your contact number. Can it be used for alchocolic cirrhosis,if yes please give mail. Yes sir, Alchorid can be used for the problem you are addressing. Detailed information about the product is on the following link https://bagdarafarms.com/product/alchorid/ You can also place the order from the same link. We offer a 20% off on online payments for orders. Sure sir. We are more than happy to call and help you. We will call you in the morning.